We have all seen some version of the color wheel, the illustrative foundation of color theory. I vividly recall a fifth-grade "art" lesson which involved each of us making our own little color wheel, with proper labels for primary and secondary colors and a key denoting contrasting ones. Useful though this most boring of art classes was, it taught me very little about the practice of color. As a lopsidedly verbal person, I just never learned how to translate shapes, shadows and moods into color the way painters do: I can only enjoy the results. Perhaps that is why I appreciate the artistic project of Adrien Patenaude, whose relationship to color is so intense that his middle name is Yellow. But looking at his work at Vermont Artisan Designs, I wondered why he hadn't chosen Purple instead. 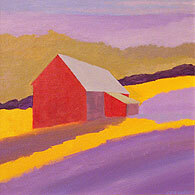 There is at least as much purple as yellow in his stylized Vermont landscapes. 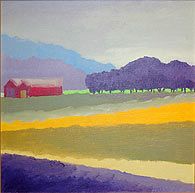 I counted four shades of lavender plus a deep purple in one small painting, whereas in the whole set I saw a tendency toward just one yellow -- a color I mentally refer to as Meyer lemon but other people might associate with schoolbuses or October sugar maples. But whether your mind favors the purple skies, mountains and trees or the bright yellow barns and houses of these mostly shadowless scenes, you cannot possibly miss the point. Some painters have a real gift for documenting the details of a Vermont farmscape, from the broccoli-like mountainsides to the long eyelashes of each cow in the pasture. 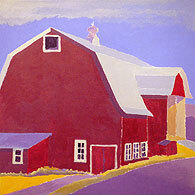 But Patenaude takes the opposite approach, painting in color fields that border on abstraction. His paintings, in all the 'wrong' colors, light up the mind with all the right reactions. "The way the sky meets the hills and landscape, and the way the seasons change the appearance in shapes and light have played a large role in expanding my perception of the environment," reads Patenaude's artist's statement. This, he continues, "has helped me to see more than just the reality of the view." That phrase -- "the reality of the view" -- would be a good one to keep in mind as you allow these paintings to show you something you hadn't noticed before about the Vermont landscape. With fall foliage season upon us, color becomes the primary, breathtaking feature of a state that is usually very, very green. But still, have you ever seen a purple tree? I haven't -- if I only consider "the reality of the view" -- but there is something about a row of purple trees with a rising fog of neon green behind it. It isn't visually accurate, but it captures an intense kind of emotional reaction that realistic paintings usually don't even try to touch. It is almost a kind of synesthesia, and something very difficult to evoke in words. Color is Patenaude's language. And it is woefully, beautifully, untranslatable. Paula Melton is Gallery Walk's Assistant Editor and a free-lance publicity writer for the arts; email: paula@paulamelton.com.